Clean alternatives help, but not nearly enough, to loosen energy-water choke point. Over 5,000 wind turbines have been installed in northern Gansu Province. Already boasting an online capacity of 5,500 MW, the region’s wind-generating capacity will grow to 12,000 MW by 2015. JIUQUAN, China—Business for wind and solar energy components has been so brisk in Gansu Province—a bone-bleaching sweep of gusty desert and sun-washed mountains in China’s northern region—that the New Energy Equipment Manufacturing Industry base, which employs 20,000 people, is a 24/7 operation. Just two years old, the expansive industrial manufacturing zone—located outside this ancient Silk Road city of 1 million—turns out turbines, blades, towers, controllers, software, and dozens of other components for a provincial wind industry already producing more than 5,000 megawatts per year. Chen Xiao Yan, a 25-year-old assistant in the New Energy Industry office, said Sinovel, Goldwind, Dongfang, Sinomatech, and 21 other clean energy manufacturers have established plants at the base. Two of those developers also produce equipment for Gansu’s expanding solar photovoltaic industry, which at the end of this year will generate 120 megawatts of electricity. Within three years, 10 additional manufacturers will build plants in the base, increasing the workforce to 50,000 employees, Chen said in an interview with Circle of Blue. Northern Gansu is doing that and considerably more. This region of dust and industrial innovation—about as far west from Beijing as Montana is from New York—has very quickly become a booster stage for China’s rocket ride to the top of the global water-sipping clean energy heap. Prompted by a national decision in 2005 to diversify the nation’s energy production portfolio, and to do so with the goal of reducing water consumption and climate-changing carbon emissions, Gansu and its desert neighbors are pursuing clean energy development with a ferocity unrivaled now in the world. Click through the interactive infographic above to learn more about China’s wind energy production. If you are having troubling viewing, click here. Along with northern Gansu, there are six other wind energy bases and eight other solar power bases being built in China—most of them in the desert regions of northern and western China. China also has a burst of seawater-cooled nuclear power plants under construction along its eastern coast. In 2010, China produced 3.15 billion metric tons of coal, according to government figures, most of it to produce electricity. Of the 960 GW of generating capacity in China, and the 4.19 trillion kilowatt hours of electricity that were produced last year, 80 percent was powered by coal. China’s coal mining, processing, and electrical generating industries consumed over 120 billion cubic meters (32 trillion gallons) of water annually, which is about 20 percent of all national water consumption, according to the China Ministry of Water Resources. Total electrical generating capacity is expected to double in China by the end of the decade, reaching 1,900 GW. The magnitude of the increase is astonishing. In 2020, nine years from now, government officials and energy industry executives project adding as much electrical generating capacity as exists today in the United States. More than half of this increase, 500 GW, according to various government and academic projections, will come from coal. Coal production and use could grow to over 4 billion metric tons per year by 2020, which is about 30 percent more than last year, according to analysts at Tsinghua University in Beijing. That means even more water will be consumed. The China Ministry of Water Resources estimates that annual water use will increase from 599 billion cubic meters in 2010 to as much as 670 billion cubic meters in 2020. The largest share of that increase—15 billion cubic meters (4 trillion gallons) a year—is due to the increase in coal mining and processing, along with cooling coal-fired power plants. Meanwhile, China is slowly getting drier. The overall supply of water available in China’s rivers, lakes, and aquifers has fallen 13 percent since 2000, according to the National Bureau of Statistics. Chinese climate scientists and hydrologists say this trend—which has reduced the nation’s total water supply by 350 billion cubic meters (93 trillion gallons) a year—will continue as a result of climate change, which is disrupting patterns of snowfall and rain. The searing conditions, coupled with China’s insistence on developing at a scale and speed never seen previously, are yielding a decisive environmental and economic choke point with global implications. The driest northern and western regions—Inner Mongolia, Shanxi, Xinjiang—are precisely where the vast new reserves of coal that China says it needs for modernization are located. For the time being, most of those new reserves can’t be tapped because there is not enough water. Northern China’s rainless weather, moreover, appears to be getting worse. Beijing and other northern and western cities are currently enduring the driest winter in 60 years. Wind energy now accounts for 42GW, or 16 percent of the nation’s non-carbon electrical generating capacity. China’s energy officials projected last year that wind energy generating capacity will rise to 150 GW by 2020, though many wind industry executives predict the number will reach more than 200 GW. Solar generating capacity is expected to jump from less than one GW in 2010 to 20 GW by 2020. Nuclear power is projected to increase from 11 GW to 60 GW in the next decade. Yet China’s demand for electricity is rising so quickly that the massive investment in new generating technologies will not make nearly as large of a dent in production—or in freshwater conservation—as many people might expect. Simply put: wind, solar, and nuclear power will climb to around 13 percent of the 1,900 GW of generating capacity expected by 2020, according to government data. That’s up from the nearly six percent of the 960 GW of generating capacity today. The new wind, solar, and seawater-cooled nuclear plants will replace roughly 100 big coal-fired generating stations, which equates to a savings of 3.5 billion cubic meters (nearly one trillion gallons) of water annually, according to academic and government estimates. The clean energy stations also will eliminate around 750 million metric tons of climate-changing emissions annually. Put another way, the $US 738 billion that government authorities promised last year to spend on non-fossil fuel power generation over the next decade will jump start China’s clean energy economic transition. The enormous solar and wind-related manufacturing plants across China already employ tens of thousands of people. They are irrefutable evidence of the capacity of clean energy to spur job growth. They also are a signal to the United States and other nations that China is prepared to dominate wind, solar, nuclear, and other cleaner sources of power that global energy economists predict will eventually generate trillions of dollars in revenue each year. Chinese development officials insist they have no intention of backing away from the country’s rapid modernization or from using every available energy-producing option to fuel that growth. A powerful transition is occurring in China, much of it focused on attracting new pioneers to the dry northern and western provinces. The strategy appears to be working. The New Energy Equipment Manufacturing Industry base, a collection of state-of-the-art manufacturing plants, is the largest non-carbon energy manufacturing center in the world, say Chinese energy officials. Click image to enlarge. 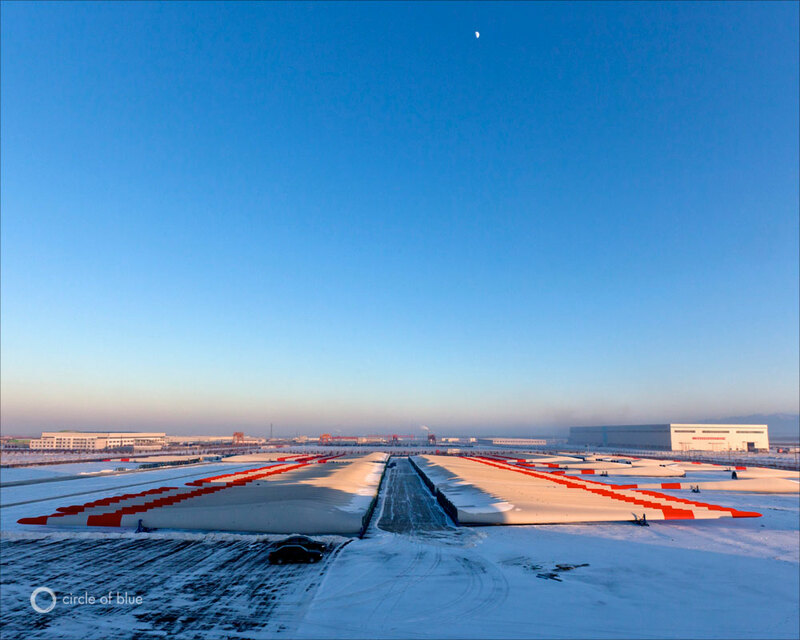 The modern cities under construction in Gansu Province, Inner Mongolia, Xinjiang, Ningxia, and Jilin are supported by new factories turning out steel, aluminum, vehicles, appliances, wind turbines, mining equipment, and hundreds of other products intended to supply China’s rapidly expanding domestic markets. High-rise apartments are under construction in clumps of 30-story concrete towers in every major city. Streets and highways are jammed with late-model and expensive cars. Restaurants are full day and night. Long lines form at checkout counters in Western-style grocery superstores. The provincial economies of northern and western China are growing at a faster rate than the national gross domestic product, which reached 10.3 percent in 2010, according to the latest government figures. The new regional growth has been spurred, in part, by clean energy production and manufacturing, which China recognized was a good fit for the windy, sunny, and dry geography. A province with 25 million residents and about the same geographical size as Sweden, Gansu has managed energy production and water scarcity for decades. Oil was discovered around Yumen in the 1930s, and a sizable production and refining industry thrived for over half a century. One of the historical highlights of Gansu’s energy industry is that Chinese Premier Wen Jiabao, a trained geologist and China’s second most powerful political figure, spent the early part of his technical and government career from 1968 to 1982 managing Gansu’s mineral and water resources. 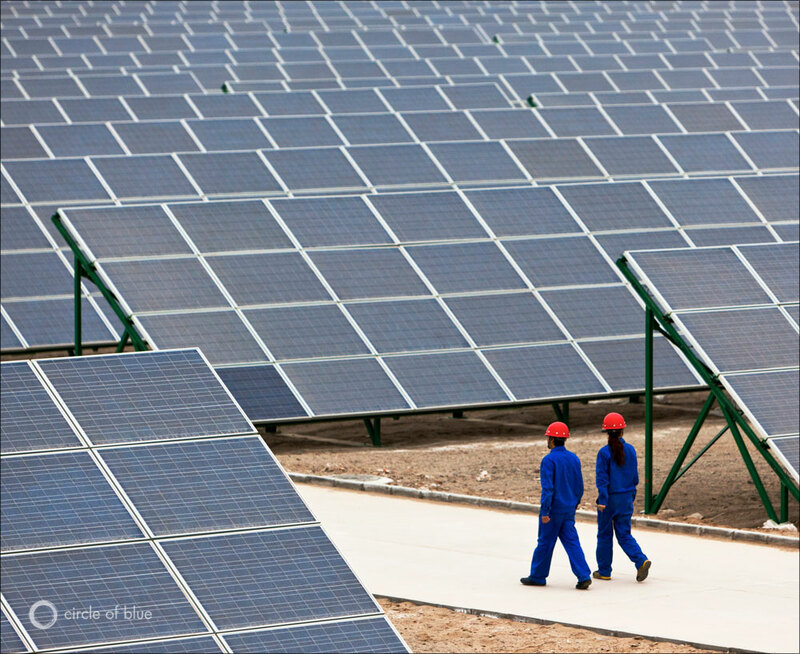 China is developing massive solar resources in the Gobi Desert of northern Gansu Province. 20 MW is already online. Generating capacity is expected to grow to 12,000 MW by 2025. Click image to enlarge. In 1996, provincial officials began to experiment with replacing northern Gansu’s oil sector with wind. They installed four 300-kilowatt wind turbines at the Yumen Jieyuan Wind Power Plant. Cities in Xinjiang, to the west of Gansu, and the Inner Mongolia Autonomous Region, east of Gansu, also joined Gansu as the first provinces to experiment with utility-scale clean energy generation. The sector grew steadily—albeit slowly—for nearly a decade, said executives here in Jiuquan. But, in the earliest years of the new century, wind power began to spin with economic authority. Prompted by internal concern for the conflict between water scarcity and rising energy demand and the goal of developing new industries that could employ millions, China enacted the world’s most aggressive renewable energy law in 2005. China’s National Development and Reform Commission declared that, by 2020, 15 percent of the country’s energy would be produced by wind, solar, biomass, and hydropower—up from 7 percent at the time. As of the end of 2009, according to the China Renewable Energy Industries Association, more than 10,000 utility-scale wind turbines had been installed nationwide. And in 2010, according to figures released last month by the China Industry Energy Conservation and Clean Production Association, China spent approximately $US 45.55 billion on 378 big wind power projects, including roughly 8,000 new wind turbines that were installed last year. Wind generating capacity in China has reached more than 42 GW—the most of any country, according to the Global Wind Energy Council. The industry is growing so fast, in fact, that China’s two national transmission companies are not keeping pace. About a quarter of the generating capacity is not connected to the grid. In the last three years, more than 5,000 wind turbines have been built in the desert of northern Gansu Province. That’s not the case in northern Gansu, where brand new, high-voltage power lines and towers—gleaming silver in the bright sun—march along the mountain ridges and across the desert. Last year, China said it was spending $US 590 billion over the next decade to expand and modernize its electrical transmission system, including $US 75 billion in the first five years for high-voltage power lines—like those being constructed through Gansu. Even in Gansu’s bitter cold winter, powerline workers trudge through the big wind farms, connecting turbines to the substations and 750-kilovolt transmission lines that carry power to the rest of the country. Since then—and mindful of the external diplomatic pressure surrounding China’s soaring climate-changing emissions—a host of other new policies and publicly financed incentives have been enacted to promote clean power that uses less water. In 2007, China established a new “water intensity” requirement that calls for industry and agriculture to cut the amount of water they use per unit of gross domestic product by 20 percent. In 2009, that target was increased to 60 percent. The government also mandated that taxpayers share in the cost of developing renewable power with a small fee on their utility bills. Electric utilities are required to buy power from renewable energy producers, which were provided with low-interest loans from the government. China also protected its manufacturers, requiring that at least 70 percent of all wind turbine components must be manufactured in the country. Five of the 15 largest wind turbine manufacturers in the world, as a result, are now Chinese. Similar incentives were enacted for the solar industry. The public incentives, combined with China’s determination to both diversify its power sector and develop new job-producing industries, have pushed the country to the front of the global renewable energy industry. One of the places that has served as a testing site for the new era of water-sipping clean-energy production is the northern deserts of Gansu, where evidence of China’s big play in clean energy development is in plain view. The New Energy Equipment Manufacturing Industry base—a collection of state-of-the-art clean-tech manufacturing plants—is the largest noncarbon-energy manufacturing center in the world, said Chinese energy officials in Jiuquan. The base sits at the southern end of a region of wind farms that stretch for miles and encompass more than 5,000 wind turbines. There are also two solar photovoltaic power plants, which are the first in a 25-square-kilometer sun power zone outside Dunhuang that will have the generating capacity of 12 GW by 2025. Gansu, in other words, hosts one of the largest clean energy zones on Earth. The investment in wind power alone will soon reach nearly $US 18 billion, according to provincial figures. The goal is to install enough capacity to generate 20 GW of wind-powered electricity by 2020, according to Wu Shengxue, deputy head of the Jiuquan Municipal Development and Reform Commission. In Dunhuang, an art and tourist center near the border with Xinjiang, Ren Tao—a 42-year-old engineer who’s an expert in water supply and energy production and is the general manager of SDIC’s 10-MW solar photovoltaic demonstration plant—described the new solar installation. The year-old, $US 18 million plant is the first utility-scale solar plant connected to China’s transmission grid. It sits at the center of the sunniest region in China and operates more than 3,000 hours a year. Across the road, a second 10-MW solar photovoltaic plant—built by CGNPC Solar Energy Development Company—began operations late in 2010. 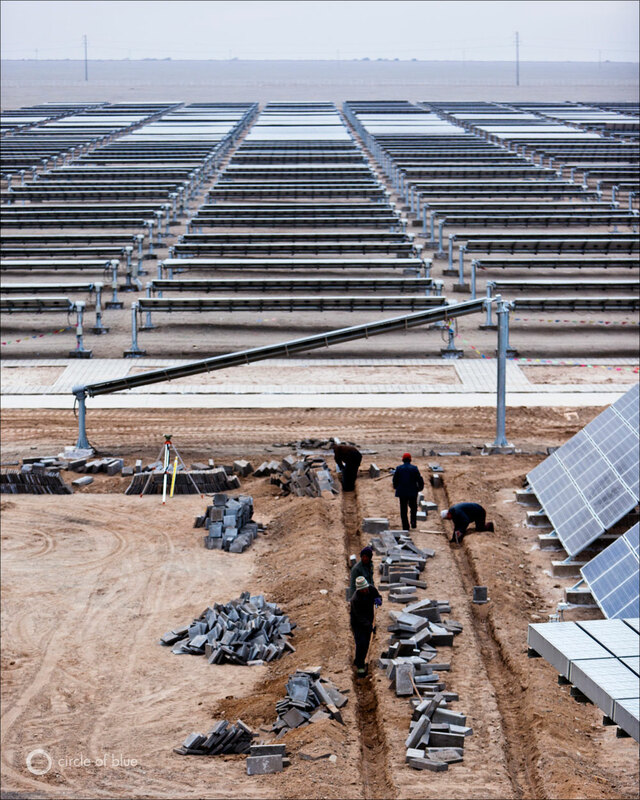 Solar energy installation under construction in the Gobi Desert. In 2009, China launched a program to build the nation’s first big solar power projects, which produced two 10-MW photovoltaic power installations in Dunhuang, at Gansu’s far northern end. More than a dozen other solar energy projects—totaling 280 MW—will be completed this year. Two of these, generating 50 MW each, will be installed in the Dunhuang solar energy production zone. The China Ministry of Science and Technology projects that there will be 20 GW of solar generating capacity nationwide in 2020; 30 percent will be installed in Dunhuang. Huang Xiao, another of the young professionals managing Gansu’s clean energy industry, is similarly committed. The 25-year-old woman is the executive of general affairs at Sinomatech Wind Power Blade Company, which operates a 40,000-square-meter (430,000-square-feet) plant, employs 1,000 people in Jiuquan, and last year turned out 2,400 wind blades. Outside her office window, more than a hundred 40-meter white blades, marked by bright red slashes at the tips, are neatly lined up in a staging area, ready to be shipped. There are two other companies in the New Energy Equipment Manufacturing Industry base that produce comparable numbers of blades for Gansu’s wind sector. With three blades installed for every turbine, Gansu’s three wind blade companies are producing 7,200 blades annually, which are enough to install 2,400 industrial-scale turbines per year. Even in frosty December, the highway leading from the manufacturing base to some of largest wind farms on the planet is a steady trail of diesel trucks carrying blades, turbines, and white-painted steel towers. The newly constructed four-lane expressway runs right through the wind power zone, where thousands of white, Chinese-made turbines stand in some of the country’s strongest and steadiest mainland winds. 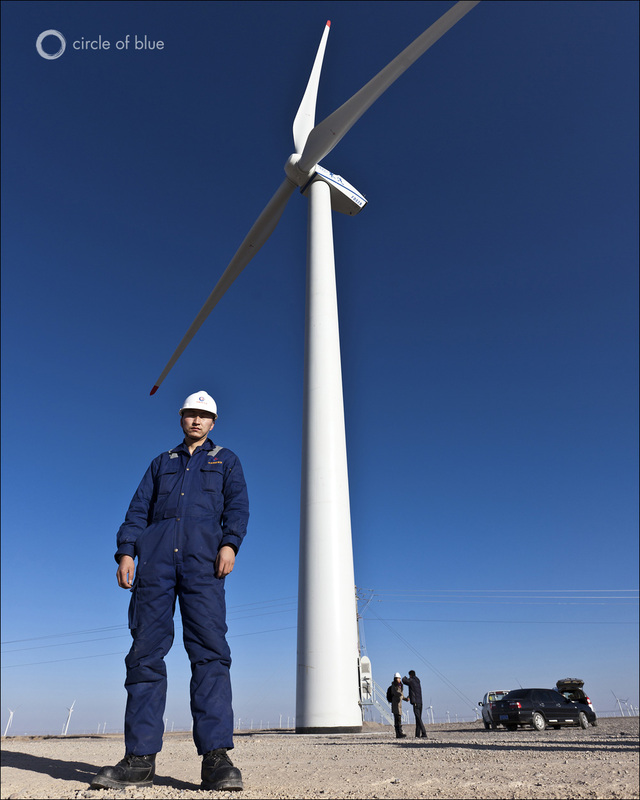 Roughly 5,500 turbines have been installed in Gansu Province and thousands more are planned. Energy developers have built new dormitories in the desert for the 15 to 20 workers required to manage and maintain individual wind farms, which typically have 500 turbines. 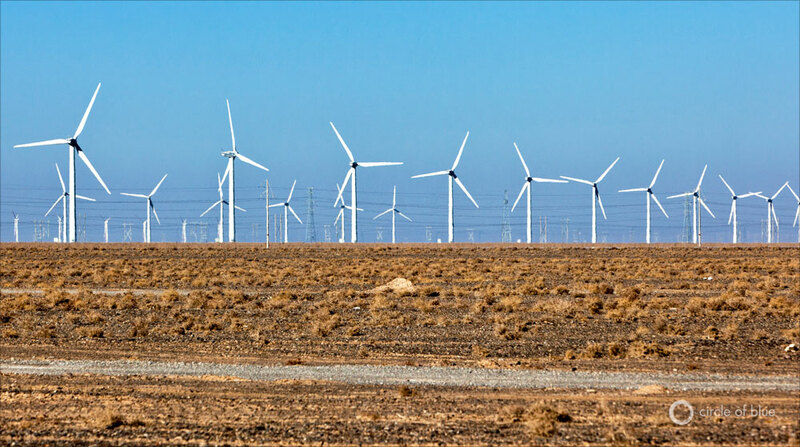 By 2015, the miles of turbines and wind farms concentrated around Yumen, a small desert city in northern Gansu, will produce 10 GW to 12 GW of generating capacity, said Shi Pengfei, vice president of the China Wind Energy Association. China’s other big wind regions—Xinjiang, Inner Mongolia, Jilin, Hebei, and offshore in Jiangsu—also are developing rapidly. This post has been revised to reflect the March update by China’s National Bureau of Statistics, which estimated the 2010 water use at 599 billion cubic meters, instead of 591 billion cubic meters, as was reported by China’s Ministry of Water Resources in December 2010. An earlier version of this article reported that the annual water consumption of China’s coal mining, processing, and electrical generating industries consumed 112 billion cubic meters of water in 2010. A revised estimate by the Chinese government in July reported that those three sectors consumed 120 billion cubic meters of water in 2010. Map and graphic by Mark Townsend, Megan Capinegro, Katelin Carter, and Chelsea May, undergraduate students at Ball State University, with contribution by Aubrey Ann Parker, a Traverse City-based data analyst and news desk editor for Circle of Blue. Reach Parker at circleofblue.org/contact. Next: A Dry and Anxious North Awaits China’s Giant, Unproven Water Transport Scheme. 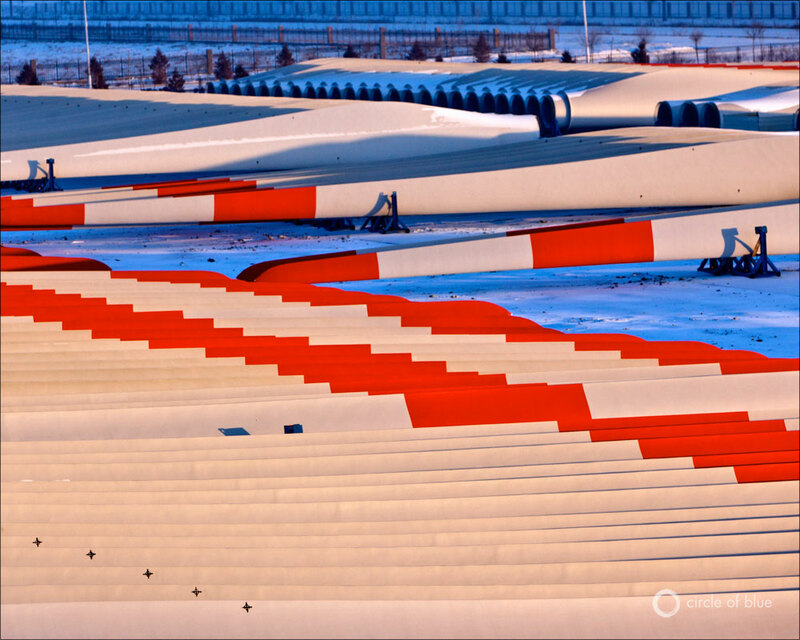 Sinomatech Wind Power Blade Company, which operates a 40,000-square-meter (430,000-square-feet) plant that employs 1,000 people in Jiuquan turned out 2,400 turbine blades last year.Click image to enlarge. The article, New Wind and Solar Sectors Won’t Solve China’s Water Scarcity, touts China’s renewable energy sector as a major solution to the water demands of China’s enormous energy production industry; however, Mr. Schneider, does little to explain these claims beyond pointing out wind and solar energy’s low water footprint and coal’s high water footprint. In fact, there are more efficient and less efficient methods of water use in coal production. In China’s scramble to fulfill its energy needs, it has implemented mostly pulverized coal power plants. Coal gasification is a far more efficient way to produce power, but requires a greater investment in technology. Other aspects of coal production can have major effects on coal’s water footprint. Slurry pipelines use water to transport coal, but pulverized coal slurry pipelines use far more water than compressed-log pipelines. As previously mentioned, underground mining is far more water costly than open pit mining. Among renewable energy production, the same sorts of distinctions exist. The disparity can hold true: a large scale photovoltaic power plant produces energy at 1 gallon/MWh, whereas coal requires 538 gallons/MWh (Pasqualetti, 2007). Unfortunately, photovoltaic power plants are not the only form of solar energy production. Solar Thermal power plants do require large quantities of water to be heated for steam to move turbines, creating twice the water impact of coal. Wind is the only renewable form of energy production not associated with any water use (except for in the production of the wind turbine, which is negligible). According to Mr. Schneider, increases in wind and solar power production from 50 to 200 GW will be met with an increase in hydropower from 150 GW to 400 GW a year. Hoekstra et al. (2008) explain how hydropower can have a significant impact on water use: “Dams in rivers create large water reservoirs. The water requirements for hydropower are mainly caused by evaporation and seepage from the reservoirs and are about 5-26 m3 per 103 kWh (electric).” Hydropower’s water footprint dwarfs that of solar thermal and coal. Schneider also mentions increases in nuclear energy production. Not only is the uranium mining water intensive, but power plants must be cooled by water and use water to produce steam to turn turbines as well, which is greater than coal at 785 gallons/MWh (Pasqualetti, 2007). Therefore, of the increase in renewable energy from 7 percent of total energy production to 15 percent in China, the majority of that causes greater water scarcity instead of alleviating it. The most important distinction the article fails to make is the one that hits closest to home. The article only takes a cursory look at what factors are driving demand for energy and water. There is no recognition of the concept of virtual water, which is defined as the water used in the production of a good. The consumer of the good is the one ultimately responsible for that water use. China exports $US 1.2 trillion worth of goods per year. China has the largest cotton production – incredibly water intensive – of any country on earth and textiles are one of their biggest exports. Much of China’s water use is not local consumption, but global consumption. Circle of Blue, the institution publishing this article, also investigated water use and energy demand in the United States, coming to the conclusion that “A number of environmental, economic, and political impediments lie in the path to large increases in American energy production. None, though, is more significant than the nation’s steadily diminishing reserve of fresh water.” Clearly, the US is circumventing natural limits on fresh water use by importing industrial goods. Therefore, water shortage is not a Chinese problem, but a problem for all developed countries that import goods from China. Excellent analysis on Wind and Solar in China and water scarcity.The spectacular achievement of China in Wind and Solar is laudable.